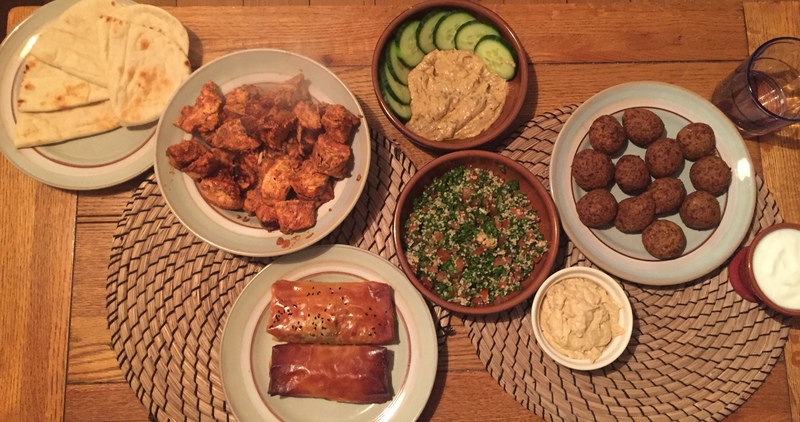 There were too many delicious things to choose from for our Lebanese meal so we went meze-style. The main event was a delicious chicken dish; I chopped up 8 chicken breasts, added 2 cups of natural yoghurt, 6 cloves of garlic, 1/2 a cup of olive oil, the juice of two lemons, 2 tbps paprika, 4 tbps sumac, a tube of tomato puree and a teaspoon of salt and pepper. I mixed everything together and left it to marinade in the fridge all day. We ended up cooking this on skewers in the oven because we couldn’t be bothered to go outside and light the grill, but it was still absolutely delicious! So incredibly tender. Definitely one to go on the make-again list. I also made some Lebanese spiced falafel using the Al Fez kit. I bulk bought these on Amazon a while ago and they work out less than £1 per box, which makes 12 falafel. It’s a really cheap, easy and veggie lunch. You just add water, leave for a few minutes, roll into balls and deep fry for less than a minute. So easy! To accompany the meal we bought two sambusak from Northwich Artisan Market. I has a beetroot and feta one which I wasn’t sure I’d like, but it was amazing – so sweet. Alex had beef version. I also picked up some baba ganoush (aubergine dip) which I don’t remember having before but it was tasty. I also bought hummus and natural yoghurt and made tabbouleh. All in all, a delicious meal, with plenty left over for tomorrow… and the day after.